A man wanted on suspicion of drunken driving led police Friday on a slow-speed pursuit, pulled over and started inhaling from balloons in a bizarre standoff that ended with officers smashing his window and pulling him from the vehicle. The suspect was identified by his father, who was at the scene, as 24-year-old Jorge Leonardo Sanchez. The man's father told NBC4 that Sanchez had problems in the past with nitrous oxide, an inhalant typically known as laughing gas that when huffed creates a feeling of euphoria. According to Los Angeles Superior Court records, Sanchez was found guilty of possession of nitrous oxide in 2009. He was also convicted of domestic battery in November 2011, trespassing in June 2011, and disturbing the peace in June 2008, according to court records. Sanchez has a 2-year-old child and was recently separated from his wife, his father said. The slow-speed chase started about 10:45 a.m. Friday and lasted approximately 10 minutes before Sanchez pulled over on Cantaloupe Avenue just north of Ashworth Street in Panorama City. The man pulled the car forward and then reversed it multiple times. An officer snuck in front of the vehicle and put down a spike strip, which the driver ran over, entangling it under the sedan. 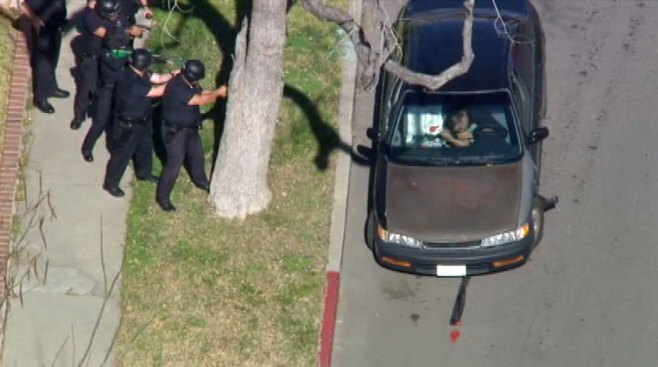 Aerial video showed the man inhaling from balloons and then refilling them with some sort of tank inside the car. At 11:12 a.m., six police officers with guns drawn approached the vehicle. After talking to Sanchez through the passenger-side window, one of the officers fired a low-impact BB round into the car, striking him. Police then swarmed the vehicle. One officer smashed in the driver-side window, opened the door and pulled the man to the ground. He was handcuffed and taken into custody.